Slippery Rock University is putting greenhouse gas emissions and energy cost reductions on a fast track, while catching up with deferred maintenance. Slippery Rock University (SRU), Pa., is not alone in the challenges it faces to make a dent in its deferred maintenance backlog. As is the case for many colleges and universities, limited state funding, rising costs, competing priorities, and a growing list of campus projects leave little capacity to pay for new roofs, windows, chillers, and central plant equipment that is exceeding its useful service life. Yet, these key maintenance items, if left unaddressed, can result in campus eyesores, safety issues, an unproductive work environment, higher energy consumption, and costly future emergency repairs. 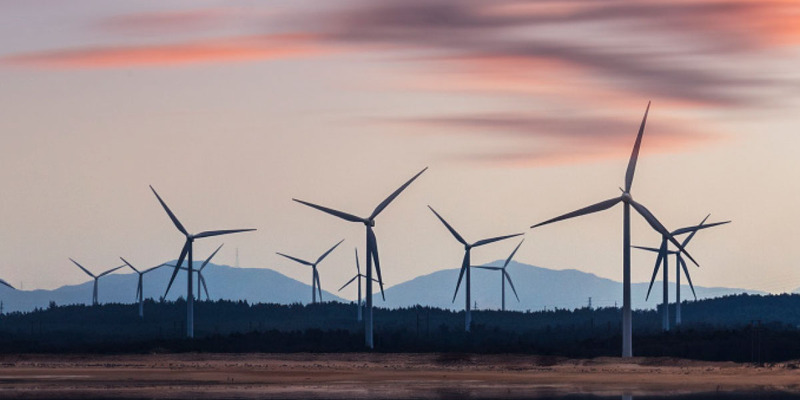 In response, SRU has developed a forward-looking strategic renewal program to catch up on its deferred maintenance while at the same time advancing its sustainability initiatives through low-cost borrowing and a guaranteed energy savings program. Starting in 2014, we began analyzing and quantifying the deferred maintenance challenges for SRU’s entire 61-building, 778-acre campus. Our division of finance, administrative affairs and advancement services created a small, agile working team of financial and facilities staff to develop a master list of the types of projects we needed to address. The backlog consisted of campus utility and building infrastructure, safety considerations, and projects where energy savings could be achieved. We then identified low, moderate, and high estimates for these projects, with the average total backlog level estimated at approximately $165 million. Of that total, about $90.9 million remained in pending capital requests or award status. With only about $2 million to $2.5 million per year typically available to spend on deferred maintenance work, our finance department began to analyze how long it would take to actually clear our backlog at that pace and what it would cost the university to do so. Our analysis assumed an average rate of inflation of 2.25 percent, using current borrowing rates. From our calculations, it quickly became apparent that our typical annual deferred maintenance spending would be far surpassed by the ballooning cost of required improvements over time. Under these assumptions, a backlog of only $50 million would take 21 years to clear and would cost $27.6 million more than what became our proposed strategy of a bond-financed Energy Services Company (ESCO) Guaranteed Energy Savings Act (GESA) program. Under Commonwealth of Pennsylvania law, governmental units are allowed to enter into a guaranteed energy savings contract in which a number of individual projects can be bundled together into one program. The law requires that the overall program have a payback of less than 20 years. Using an RFP selection process that includes reviewing the firm’s qualifications and similar completed projects permits the university to basically adopt a design-build-bundled project construction approach using the ESCO to manage the entire process. This allows the entire design and construction processes to be compressed, allowing improvements to be made much more quickly than with the conventional design-bid-build approach otherwise required in the Commonwealth of Pennsylvania. From our analysis, even worse than the delay in clearing this backlog was the projected cost to the university. This totalled $63.7 million—or 27.4 percent more to complete this work than at today’s dollars. This inflationary avoidance would more than offset any premium associated with utilizing this innovative contract vehicle. Not only did the business-as-usual approach carry a high price tag, but the university would be risking that some building components would likely fail in the interim, causing disruption and even more costly emergency repairs or replacement projects. 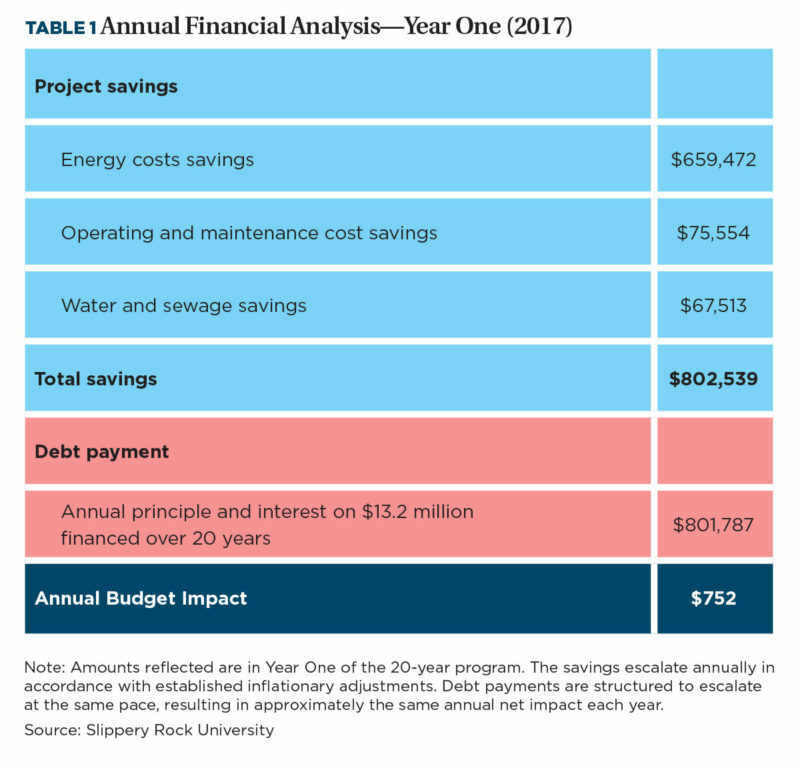 Conversely, if SRU were to pursue a program of borrowing funds through a guaranteed energy savings program, our analysis proved it would be a much more strategic, less risky, and less disruptive approach to managing our deferred maintenance. Armed with this information, our division leadership and finance and facilities functions began sharing these findings with key stakeholders within the university, the Pennsylvania State System of Higher Education, and the University Council of Trustees. During these conceptual presentations and conversations, we discussed the true impact of handling deferred maintenance with a business-as-usual approach. The process unfolded as an educational and awareness program, without the pressure of a proposal to approve or a resolution to sign. This method also allowed for an open dialogue and resulted in laying the groundwork for future requests. We next launched a two-phase RFP process for a GESA project in late summer 2015. We shortlisted four of the 11 firms that responded to our qualifications proposal, and requested more detailed assessments in the second phase. Within a competitive process, each firm submitted detailed energy savings proposals. Upon conducting a comprehensive assessment, the university selected Honeywell Industries and entered into an investment grade agreement featuring $12.3 million of proposed improvements. These hard costs included $8.6 million in energy conservation measures and $3.7 million in deferred maintenance projects—combining to result in a 20-year guaranteed savings of $19.1 million. After incorporating financing costs and estimated costs of design, construction management, and contingency, we calculated the project would achieve a payback of 15.1 years and positive cash flow for every year within the 20-year time frame. As outlined in Table 1, our assessment showed energy, water, and sewage utility cost savings, as well as operating and maintenance cost savings. These savings were slightly greater than the program’s annual debt service, making it budget neutral. In summer 2017, the university received approval to move forward with the program, signed the GESA contract, and began construction and implementation of the improvements. 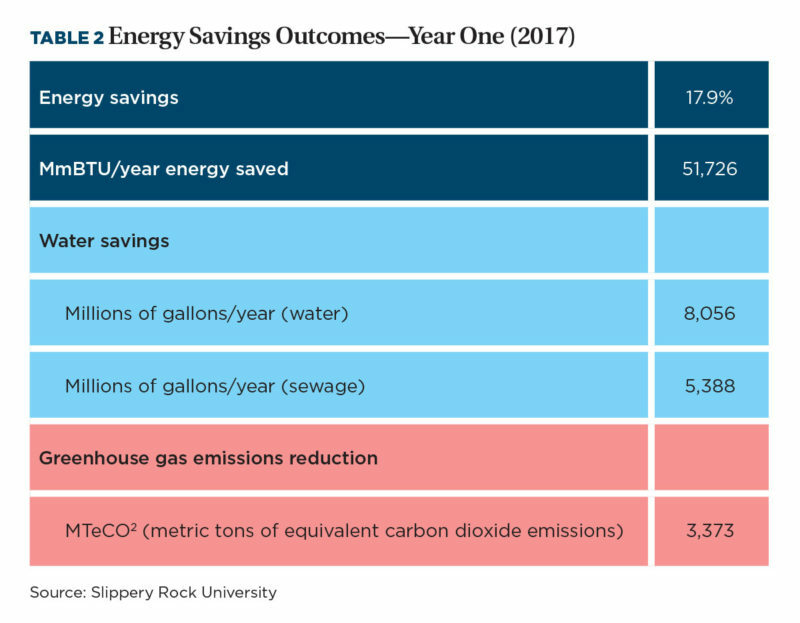 As shown in Table 2, SRU’s energy savings are estimated to be almost 18 percent of its baseline energy use, with a reduction in greenhouse gas emissions of approximately 12.5 percent. From our experience, we strongly recommend that when undertaking this type of assessment, organizations include a qualified third party that has the technical experience to assist in vetting the final scope of work, reviewing the energy savings assumptions, and projecting energy escalation rates, designs, and calculations. In SRU’s case, we used an existing contract with the Penn State Facilities Engineering Institute, which has engineers on staff who are familiar with our campus buildings and systems and who also had previous experience working in the ESCO field. Ensuring that the energy calculations and escalation rates were realistic. Identifying technical issues with the scope of work. Identifying when it made sense to allow operating and maintenance savings for a particular energy conservation measure. Ensuring that the associated risks and verification strategies to be used as part of the project were fully understood. They also participated in the on-campus interviews of the final four firms, and their feedback was instrumental in helping us decide which company we ultimately selected. To ensure the ESCO firms applied due diligence in preparing their proposals, SRU also included a contractual provision to protect the university from pricing and payback risk when the successful firm completed the final agreement. Each firm was required to guarantee that, between its second step proposal and the final agreement, energy conservation measure pricing and energy savings estimates could not vary by more than plus or minus 10 percent, assuming that the scope of work did not significantly change. Reference checks were also performed on customers of the previous successful and not-so-successful projects of the ESCO companies to see how well the finalists stood behind their guarantees. SRU’s guaranteed energy savings program is legally required to generate positive cash flow through reducing utility costs in excess of annual debt service for the cost of the improvements. The pure energy conservation measures have, to date, accounted for $8.6 million of the university’s program. Because the conservation measures have produced such a high amount of energy savings, it has allowed the university to bundle these with low energy-saving items to address deferred maintenance while still keeping the overall program within the required thresholds of a 20-year payback and positive annual cash flow. Included in the $3.7 million in deferred maintenance projects to date were the replacement of nine chillers, steam and condensate distribution piping, air handling units, heat pumps, and all the windows in three buildings. The overall energy savings program is neutral-to-positive for the operating budget, with the energy savings providing the funding capacity for the annual bond payment. The guaranteed aspect of the program requires that these energy savings be achieved and that Honeywell Industries write a check to SRU for the difference, if the savings are not realized. Most importantly, this program avoids having the university commit its own resources to fund these projects. SRU will continue annual spending towards deferred maintenance but will be able to clear more of the backlog by having addressed many higher-priority projects through this program. This allows work that was slated for years in the future to be completed sooner, because the backlog has been reduced through the funding provided through this guaranteed energy savings program. SRU has further leveraged its analyses of the true cost of deferring maintenance work towards addressing other building needs. Concurrent with the analysis of the ESCO program, the university also evaluated significant renovations for three academic buildings that encompassed large amounts of deferred maintenance. The financial analysis of the cost of delaying this work proved highly valuable in convincing decision makers that bond financing and addressing these needs now, rather than later, was the best choice. In addition to this ESCO program already underway, SRU Housing LLC—the affiliate that owns the university’s residence halls—is evaluating an opportunity to participate in a similar program. The energy savings proposal for these buildings entails a set of improvements of approximately $6.3 million. It would accomplish deferred maintenance work for critical building infrastructure including heat pumps and condensate lines. Pursuing this program would allow the affiliate’s replacement reserves to be preserved for other needs such as carpet and furniture repairs. Increases access by lowering tuition. Enhances the university image and working and learning environments. Reduces risk and increases accountability. What makes our program truly innovative is the way in which our financial and facilities staff have partnered to create a seamless, integrated team with the breadth and depth of experience to minimize risk and thoroughly address all aspects of such an undertaking. Together we conducted detailed evaluations of the practical, technical, and financial aspects of each ESCO proposal, working with the selected firm to optimize and prioritize the final list of projects, and coordinating and communicating construction schedules and impacts to the greater SRU community and university shareholders. Financial impact. The $19.1 million in guaranteed university cost savings, positive project cash flow each year, and avoiding the need for the university to commit its own resources to fund the projects all help SRU stabilize and improve its overall financial standing. Impact on morale. The team’s communication with the larger SRU community—informing all stakeholders as to the benefits of bundling these projects together in a less disruptive manner—allows stakeholders to understand the priorities involved and the timing of improvements to be made to the buildings they occupy. Likewise, it gives them insight into the positive benefits gained from improving their physical work and learning environments through the improvements made to the lighting, heating, ventilation, air conditioning, energy management, and utility monitoring systems and building envelopes. Overall, the program has improved the image of the campus for students, faculty, and staff. Impact on sustainability initiatives. As a signatory to the Presidents Climate Commitment, this program is yet another step toward SRU meeting its commitment to achieve carbon neutrality by the year 2037. The university is already on track to reduce our emissions by an additional 12.5 percent during the next two years. Additionally, the university’s energy conservation committee, which includes faculty, staff and students, can now leave the exploration of physical energy conservation measures to professionals and focus on another area with an even better return on investment potential—promoting behavioral change to conserve energy and live more sustainably as a campus community. SCOTT ALBERT is assistant vice president of facilities and planning; MOLLY MERCER is associate vice president for finance; AMIR MOHAMMADI is vice president of finance, administrative affairs and advancement services; and PAUL SCANLON is director of sustainability, Slippery Rock University, Pa.
Slippery Rock University’s guaranteed energy savings program is legally required to generate positive cash flow through reducing utility costs in excess of annual debt service for the cost of the improvements. Hear Amir Mohammadi explain more about this topic at the NACUBO 2018 Annual Meeting in Long Beach, Calif. He’ll appear in a Snapshot, in The Lab, at 1:30 p.m. on Monday, July 23. Check out Slippery Rock University’s “Campus Efficiency Poster” detailing the benefits of SRU’s guaranteed energy savings agreement. Find more institution posters and sustainability resources at NACUBO’s Facilities and Environmental Compliance page.